Some films are totally unpredictable, taking on a journey you don’t expect with countless twists and turns in the narrative to make your head spin. Other films you go into deliver exactly what you think as if the poster, title and even trailer tell you everything and so when you pay your £10 or whatever the price is, you aren’t surprised, shocked or even shaken. You are just on that country road where the nice pub is at the end. That is exactly the kind of movie Finding Your Feet falls into; a British comedy-drama that ticks all the right boxes for the grey pound, for whom this movie is definitely aimed at. With its comfortable cast and a setting in middle-class London, you know all the beats and steps to a satisfying ending. Except this one certainly has its feet rooted in the world of depression as well. Sandra seems to have a perfect life. Married for years to a former police officer going into retirement, she lives in a huge house with lots of influential friends and is about to become a Lady, when her world is shattered by discovering her husband has been having an affair. Leaving him, she finds herself at her sister’s house, a flat in a rundown area where Bif is free-living, swimming in freezing water, smoking joints and enjoying life to the full, including going to dance classes. Trying to remove her sister’s stuffy, snobby attitude, Bif drags her to the dance classes, which she once used to enjoy. There she meets Charlie, a handyman who lives on a barge and who is world’s apart from her former existence, yet Sandra finds she can finally live again. Richard Loncraine’s safe direction takes us through the story just how it should be told. Like following instructions to a flat-pack bookcase, we follow the path of ups and down as Sandra has to adjust to her new life outside of the grandeur of her middle-class world, while mourning the loss of her husband and home and having to come down a notch or two but finding that this isn’t such a bad thing after all and that for years she had been the happy housewife, trapped in a world of cleaning when she could be living the life she really wanted. This is all well and good and along the way, she gets her knocks and has to make decisions about where she wants her life to go. While Sandra is going through the heartbreak of her life, Bif decides to live her life like she’s still in her teens. As with these kinds of films, there is a surprise around the corner but nothing too horrific but enough to set the tear ducts working. This is the thing with this film. For a movie about being positive about life and taking the bull by the horn, it throws in some very depressing moments, dealing dementia, cancer and death. You wonder if the film was supposed to be a feel-good comedy or a way to inject misery into your life. Funnily enough, this is a Christmas movie (it was supposed to have been released last year but got bumped for the schedules). The dialogue is sometimes ropey and there are so many contrivances along the way you wish someone would put up a sign to say “change of mood coming…watch out!” Yet the film survives thanks to the performances of the likeable lead cast. Imelda Staunton is one of this country’s best for a reason and here as Sandra, she shows why. A hateful, nasty woman at the start we follow her as she slowly softens into a woman who notices just how much she gave up for a life with her husband. The relationship between her and Charlie, brilliantly played by the ever-reliable Timothy Spall, is enjoyable to watch and Spall gets he real heartbreaking moments in the film. Celia Imrie is delightful as Bif and it’s always good to see David Hayman on screen. 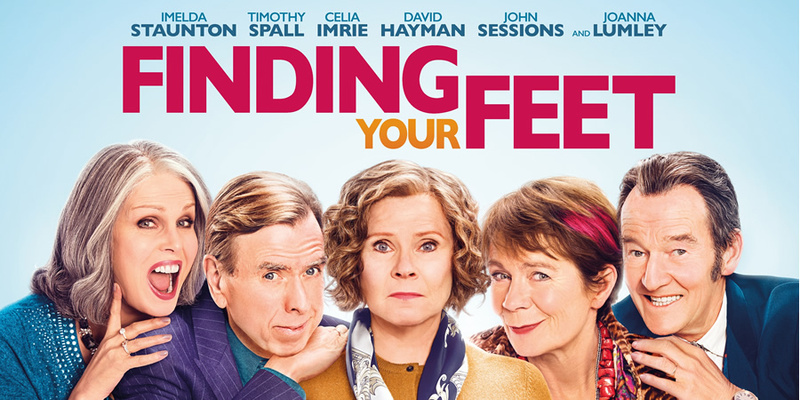 Finding Your Feet is a perfect Sunday afternoon affair for those of a more mature age who like their films gentle, without violence and with a cast they can rely on. This is that film. If you are looking for something a little deeper, then look elsewhere but it passes the time pleasantly enough, just don’t look too deep into the script or direction or you may well hate it. One thing, it does have the cheesiest poster ever for a film.